With a my Social Security account, you can view your earnings history, confirm you have enough work credits to retire, and see estimates of what your benefits will be. Open your account today! Our Retirement Estimator is a great tool that provides you with immediate and personalized estimates based on your own earnings record. This allows you to receive the most accurate estimate of your future retirement benefits. Estimate your benefits now! After you have viewed your earnings history for accuracy, confirmed you have enough work credits to retire, and determined the best age for you to retire, you can get started on the next phase of your life right away by retiring online! Retire online today! This National Social Security Month, remember that Social Security is here to help you secure today and tomorrow. Visit our online services website today to see all you can do with us online. This entry was posted in National Social Security Month, Online Services, Retirement and tagged baby boomers, benefits, My Social Security, my social security account, retire, retirement, retirement benefits, Social Security benefits by Jim Borland, Acting Deputy Commissioner for Communications. Bookmark the permalink. I’ve been receiving my Social Security Spousal benefits based on my husband’s income and benefits. 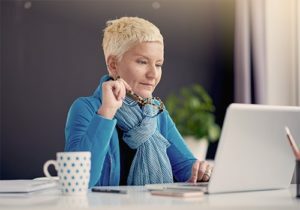 I was eligible for and used my option to restrict my application for benefits to exclude my own work record, allowing my benefits to increase until age 70. I have a My Social Security Account and therefore do not receive a paper print. Since filing for benefits my electronic record has removed access to estimates of future benefits so I can no longer use the tool to make retirement decisions. A flaw I have contacted SSA about and highly recommend that you revise software to allow access again to retirement information for planning. hi. if i am in algeria . haw can i be in this Compagnie? Why, just do the 3 recommended things for retirement. I’m in Outer Slobovia and it worked for me. don’t think i can get my retirement i didn’t work to get my full 40 credit and i am 64 years old my health is not improve.my earning credit is 25 but i need 15 more.i hope i can get my ssi benefits to survive now. You’ve been a busy bee, 6 years of covered work in the last 45 years. I don’t think i can get my retirement i didn’t work to get my full 40 credit and i am 64 years old my health is not improve.my earning credit is 25 but i need 15 more.i hope i can get my ssi benefits to survive now. Please sent my pension I am starved hungry to survy. also i have medicare but I cant use hiar. I don’t feel happy, better, comfortable, I feel. My body change and my mind too. Sometimes, just I want to be a lone. To anybody just Jesus Christ. Most shet more bigger and this world. Including all the people work for ,then. They are devil, they don’t care anybody including me.thry don’t know how I feel is ok. and they don’t care all you, but and the end, GOD Came for me and all of you. God is coming, go out into the woods, lay down and go to sleep my friend. Hello Mr. Borland, I have been trying so hard to connect with a person that would come to our company and do a Lunch & Learn on SS. Can you help me? Can you suggest someone I can contact? There are approximately 200 people in this office but we are an international company. Most SS offices have a field representative who would be glad to talk to your employees. Call your local office. Don’t think this public site is appropriate to book someone. Mr. Borland has more important things to do. Most field offices don’t have FR’s anymore. This has been the case for 20-30 years. Someone has to be removed from operations to attend. Local offices must weigh the advantage of what is gained by having an employee offset against a stressed field operation. Welcome to the world of “reducing the size of government”. Some of us are lifetime disabled. Born with disabilities we could not overcome, we struggled all our lives to live on what lirlle SSA we did managed to get, SSI and or Survivors Benefits. What happens to.us as we hit retirement age? It’s very difficult to live on these tiny checks with other benefits ending or being cut. What do we do? When you reach retirement age, nothing happens, you’ll continue to receive what you’re getting now. I went in person and still got it wrong,I’m retiring on 5.1.18 so I wanted to stop my survivors social security and start mine in May.Last week in the mail I get 2 Medicare cards mine and my deceased husbands and I get 2 letters from social security what I’ll be getting for my social security which I want them I get a letter for my deceased husband social security I know I can only get one,so I’m waiting to see which one I get 3rd Wednesday or 4th Wednesday which is mine .So frustrating I thought I did everything right. Good grief! You should have had someone doing your paperwork long before you became disabled. Why was I not included in the 2 percent increase in my SS check this year, 2018? My name is Nancy V Burns, 1111 Gravois Road, Apt 301, St Louis, MO 63126.phone 314-270-4224. Don’t ask personal questions on a public site. Read your paperwork from them. You probably received it but the deductions for medical services went up even more, leaving some of us with even less than we received last year. Hi Nancy! Unfortunately, and because of security reasons we do not have access to personal records in this blog and cannot answer your question at this time. One of our representatives should be able to provide you with an explanation. Please call our toll free number at 1-800-772-1213 for assistance. Representatives are available Monday through Friday, between 7 a.m. and 7 p.m. Generally, you will have a shorter wait time if you call later during the day or later in the week. Just a reminder – Please be cautious about posting personal information on any social media channel. Thanks. How do we get taxes withheld from our social security checks? In April we celebrate “National Social Security Month“, see what you can do online at http://www.SocialSecurity.gov. Thank you, Nancy! Sam, I just read an article on Yahoo Finance the other day about Jack Welch formerly CEO of GE saying that we should banish the word retirement from our vocabularies. 🙂 Just thought that”d be a great jumping off point for one of your future posts and fairly relevant to this article. I am currently not in the mode of thinking about retirement with the coming birth of my son. I do think that late 40”s feels about right for retirement. It”s more or less based on the age my son will be more than about my financial situation. I would love to stay home with my wife and raise my son as a retired person. It”s because I want to give my son a solidly middle-class upbringing that I am committed to working for a steady paycheck, a growing 401k and other investments, and extremely importantly healthcare coverage. I do believe that once I near the cusp of retirement I would prefer to retire earlier with less of a solid financial position than to grind out due largely to ability to enjoy life with my wife and family. Obviously the ideal is get a side business going and have both. I am on SSD at what age do I get on regular Social Security.? Great question, Wanda! Social Security disability benefits automatically change to retirement benefits when disability beneficiaries attain their full retirement age. Benefits are not interrupted with this transition and the benefit amount will generally remains the same. I am having trouble signing up for Medicare. My birthdate is July 17, 1953 so I have to be enrolled today. I’m being locked out of the system because it couldn’t identify me. Help. I need to apply for a new social security card. I think mine might have been throw away. My husband was not aware that it was in a folder,he thought was old. Esta informacion esta Fantastica!! !.Muchas gracias! We appreciate your thoughts, Ronald. Thanks for your comment! I am 65 years old recently…..if i to delay my social security…..do i need to make appt ???? ?PLEASE suggest and/recommend!!!!!!! Hello Daniel, if you delay your retirement beyond full retirement age, you earn delayed retirement credits automatically up until age 70. Delayed retirement credits increase your monthly benefit. Most people age 65 or older are eligible for free Medicare Hospital Insurance (Part A). Remember to sign up for Medicare only online if you delay your retirement benefits. If you need further assistance, please call our toll free number at 1-800-772-1213. Representatives are available Monday through Friday, between 7 a.m. and 7 p.m. Generally, you will have a shorter wait time if you call later during the day. Thanks! I’m impressed, I must say. Really rarely do I encounter a weblog that’s both educative and entertaining, and let me inform you, you could have hit the nail on the head. Your concept is excellent; the issue is one thing that not enough people are talking intelligently about. I’m very pleased that I stumbled across this in my seek for something relating to this. Great question, Sondra. Your ex-husband must be of retirement age (62 or older) or be receiving disability benefits for you to qualify and receive benefits on his record. If your ex-spouse does not apply for retirement benefits, but can qualify at age 62 or later, you can receive benefits on his record if you have been divorced for at least two years. Keep in mind that if a person begins to receive benefits at age 62 or prior to their full retirement age, their benefits are reduced. Unfortunately, these reduction factors are permanently applied to all benefits in which an individual may qualify, this would include your divorced spouse’s benefits. Also, keep in mind that if you are eligible for retirement benefits on your own record, we pay that amount first. If the benefit on your spouse’s record is higher, you will get an additional amount on that record so that the combination of benefits equals that higher amount. See our Retirement Planner: If You Are Divorced for more information. I cannot afford to be totally out of money but I want to retire in October at age 62. Do I have to stop working full time in order to apply? I know I have to reduce my hours to about 20 hours a week afterwards but I wanted to go ahead and start the paperwork. I’ve been told I make too much money to retire. Can you help me understand this? Hello, Sharon. If you are younger than full retirement age and make more than the yearly earnings limit, this can reduce the number of payments you receive through the year. For 2018 that limit is $17, 040. If you applied and received benefits prior to attainment of full retirement age, and work part-time thereafter you will be considered “retired” only if your monthly earnings are $1,420 or less. Also, if your earnings will be over the limit for the year but you will be retired for part of the year, we have a special rule that applies to earnings for one year. Please visit our Retirement Planner: Getting Benefits While Working for more information. If you have specific questions about your situation, please call our toll free number at 1-800-772-1213 and speak with one of our agents. Representatives are available Monday through Friday, between 7 a.m. and 7 p.m. Or contact your local Social Security office directly. We hope this helps. I applied for social security in December 2018 and have been approved to start receiving benefits effective Jan 2019. The amount on my benefit letter does not include the 2.8% increase I have been reading about. Will there be an adjustment to my payment amount once SSA receives my income for 2018? Hi Anita, thank you for the question. Unfortunately, and because of security reasons, we do not have access to personal records in this blog and cannot assist you. the weather etc. We’re going away for one day / night for some private time, Sunday Monday.